Hastings United Football Club attacking player Youssouf Bamba has returned to former club Walton Casuals, according to Walton themselves. Walton’s Twitter feed reported this morning (Friday) that the jet-heeled wide left player is back with the Stags and will go straight into their squad for tomorrow’s match at home to Dorchester Town. Bostik League South East Division high-flyers Hastings signed Bamba from Walton back in October, with manager Chris Agutter hailing him ‘the best left winger in the league’. Bamba went straight into the side and quickly impressed with his pace and ability to beat opposing defenders, and scored five goals in as many appearances from late October until mid-November. But after the arrival of Jordy Mongoy in mid-December, Bamba frequently found himself on the substitutes’ bench. 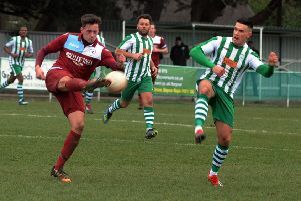 In fact, he started just four Hastings games since Christmas, including two of the last three, and came on as a second half substitute during last weekend’s 3-2 win at home to leaders Cray Wanderers. Bamba made 25 appearances in all for Hastings, 17 from the start and eight as a substitute, and scored five goals. Walton play one level above Hastings in Evo-Stik Southern Premier South having been promoted from the same division last season. The Stags are currently 17th in the table, just above the relegation zone. 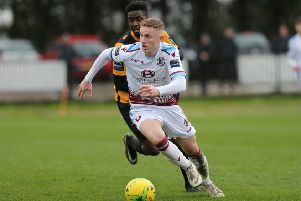 Young Hastings defender Tom Climpson has dual registered with Southern Combination League Premier Division high-flyers Eastbourne Town and scored on his debut against Broadbridge Heath last weekend.